The Jesuit Post: An Interview with Michael Rossmann, S.J. Michael Rossmann, S.J., is a Jesuit scholastic who serves as editor-in-chief of The Jesuit Post, a website of social commentary founded in 2012 by young U.S. Jesuit writers. He is currently completing theology studies at Boston College School of Theology and Ministry in preparation for ordination to the priesthood. An Iowa native, he also writes occasionally for America and The Huffington Post. Mr. Rossmann holds a B.A. in Economics and Theology from the University of Notre Dame, where he was valedictorian of the class of 2007, and an M.A. in Applied Philosophy from Loyola University Chicago. America Media became publisher of The Jesuit Post on March 10 earlier this year. On June 2, I sat down with Mr. Rossmann for an interview about his website and its role at America. The following transcript of our conversation has been edited for style and length. You became editor of The Jesuit Post (TJP) in January 2015. How do you understand the mission of TJP? One phrase we often use is speaking to our peers “as one friend speaks to another.” This phrase actually comes from the Spiritual Exercises of St. Ignatius. And we actually try to take the conversations we’re already having with our peers and have them in a more public space online. Just as we Jesuits speak with our friends about God, the church, sports, pop music, and the latest online fads, we similarly talk about those things—the sacred and the secular and everything in between—on The Jesuit Post. We’re primarily a website and we’re particularly interested in speaking to our peers, young adults, but we’re very much interested in readers at all stages of life as well. Why did TJP merge with America Media earlier this year? Our new partnership with America Media is a win-win for all involved. With the institutional backing of America, we now have the foundation to continue to share our distinctive, fresh voice for the long haul. Similarly, because we have such a pulse on what young adults are thinking and talking about, we can share those insights and emergent forms of communication with America Media so that they might also benefit. How does TJP complement the work of America’s other media platforms? Perhaps the biggest way TJP complements America Media is that we are primarily speaking to an audience that perhaps has been less penetrated by the print magazine. Moreover, we can also write in a personal and oftentimes less formal style that is easier to do online. That further complements the ways America Media can speak to different audiences. How is the partnership between America and TJP going so far? So far, so good! One big part of this new partnership was going together to the Religious Education Congress in Anaheim in March, where those from America Media and two of us from The Jesuit Post were at a booth together. We talked as a single entity to many people throughout the event. I’m also in regular communication with everyone at America and I have visited America’s office in person a few times. 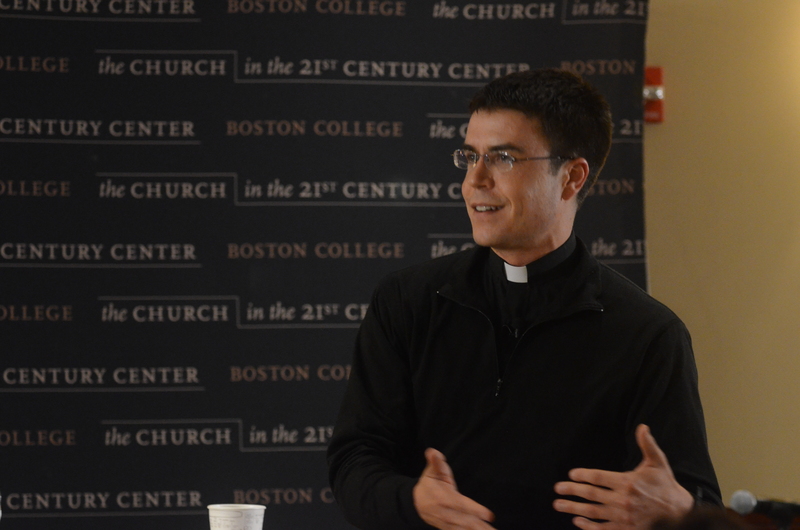 It’s exciting to imagine future possibilities for guys who have worked with The Jesuit Post to step into different roles at America at some point. With social media, there’s been a strong conversation and cross-promotion between America and The Jesuit Post. We read and share things from America and they likewise share with their readers some things we are doing. What audience does TJP serve? We are particularly writing for our peers—young or youngish adults particularly in their 20s and 30s—because our TJP contributors are Jesuits in formation mostly from that age range themselves. One surprise we’ve had is how many people from different ages read us, but we still aim at that age range. The plan from the beginning has been to continue handing on TJP to future generations of young Jesuits in formation. For example, I will likely be editor for two years and then pass on the job to someone else before my own ordination. From your perspective as editor, what is the greatest need in the Catholic Church today? I think we need to listen to people’s experiences and hear how and where they are finding God and how they are finding abundant life. We need to continue to pay attention to how this faith of ours speaks to the people and needs of our time, although that requires that we try and see how the timeless message can best be shared and discovered in our time. That requires a lot of listening to where people are and it requires some flexibility as well, in both discovering the presence of God in places we might not have expected and in sharing our faith in ways which might be new or different. What’s your favorite scripture passage and why? John 10:10. “I came that they might have life and have it more abundantly.” For me, the life of faith isn’t merely a duty, but God’s incredible gift to us. It’s a gift that’s not static. God loves us so much that God doesn’t want us to just get by, but to continually go deeper into God’s life. What is your impression of Pope Francis? He’s been such an inspiration. I’m particularly struck by how free he seems to be and his joy that is so contagious. Speaking of Pope Francis, a few of us from The Jesuit Post plan to be in Philadelphia for the World Meeting of Families, reporting from the ground and participating in an event for students from Jesuit high schools. It’s a pilgrimage for students. While we often write for people a little above high school age, being at that event and then at the larger gathering of millions of people in Philadelphia for the pope’s visit will give us greater insight into how young people are receiving the faith. I write a monthly column for The Jesuit Post called “One Friend to Another,” using this theme that is at the heart of our mission. And my experience of TJP has really been one of friendship. Jesuit friends started this thing at the beginning of 2012 and invited me to join. While I was out of the country for two years, working in Tanzania physically removed from others involved in TJP, it was still a great experience of community and friendship for me—and just a lot of fun. As I lead The Jesuit Post, I want to continue to cultivate that experience of community among those Jesuits who contribute, and then ultimately with our readers. I want to be able to have conversations with people regardless of where they might be. Moreover, with our new partnership with America Media, I look forward to deepening that sense of friendship in terms of learning from one another and seeing what’s possible. My sense of what young Jesuits study in graduate school over the last 15 years is mainly theology, philosophy and canon law. I hear from Jesuit leaders that these are important but not in such abundance. This article gives me hope and enthusiasm in the contemporary Society: that solid work in media and communications is coming alive again among younger Jesuits. Were not the first and renowned Jesuit colleges in Europe places to study theology, art, music, mathematics, physics,etc? Isn't it time to help people see that in these areas of human encounter the One God can also be sought? Thanks for reading. I'm glad you found the interview encouraging.